Retailers stagger from the Schlock Era to the Information Age: What just happened? You wouldn’t want to be a bricks-and-mortar retailer — or one of their shareholders, or, the very worst of all, employed by any of those evil clowns in that foul sector. Not in a time when the planet’s biggest and baddest name in retailing spends a fortune each night on television ads, trying to sell the message that they aren’t as loathsome as everyone knows them to be. If, however, it’s your unhappy lot in life to scrape out a near-livelihood from retailing, the only question on your mind will be: How to survive in an endeavor that is (a) relentlessly cutthroat, and (b) in permanent decline? There are two possible answers, and last week we got to hear them both. Last Monday, Canada’s leading grocery retailer announced it plans to buy the country’s dominant retail pharmacy chain, in a $12.4 billion tie-up. The transaction involving Loblaws groceterias and Shoppers Drug Mart promises a few small synergies, and, more significantly, also keeps Walgreen’s, the titanic US drugstore group, from entering Canada by way of acquiring Shoppers. That small cost-saving and modest defensive action does not equal anything close to the crazy-generous $12.4 billion valuation for Shoppers, which calculates a premium payment of $4 billion. Plainly, that sum represents more than the anticipated markup on Kleenex, Pringles, Noxema and Maybelline. Which is where the two words “Big Data” begin to be heard. Shoppers runs Optimum, a 13-year-old customer loyalty program that has enrolled 10 million members, or roughly half Canada’s adult population. Loblaw, stodgy and halting, is late to the party one more time, having just launched its affinity-card scheme earlier this year. Shoppers wrote the book on managing retail pharmacies, and runs several abstruse niche operations that Loblaw will never, ever be able to fathom. But the grocery braintrust is just sharp enough to recognize Big Data when it happens to drive over them in an armored tank. All that needs to be understood on the conceptual side of Big Data is the ability to directly redirect a few hundred thousand households from regularly purchasing Original Sunny Delight, to the aisle that contains New-and-Improved-Sunny Delight-Now-with-Oat bran. This is achieved through the judicious use of data-mining and target-selecting, followed by incentivizing through couponing and sampling — and all the other insidious forms of recognizing patterns of human behavior, and shamelessly manipulating same. How quickly can you earn back your $4 billion sweetener, or the entire $12.4 billion investment, if you and you alone have the ability to sift through the proprietary data-mountain formed by half the country’s households? Fairly freakin’ expeditiously, I will guess. This will be the key point that Canada’s federal trade regulators will need to assess before allowing this acquisition to go ahead. And therein lies the rub. Because the only seeming alternative for retailers to embracing Big Data is to scuttle off the stage. This, essentially, is what Sears, the quintessential department store chain, is doing, through selling its prime-location leases back to landlords for one-time cash payments. Visiting a Sears store anywhere in North America most days is akin to having an out-of-body experience. The lights are on, the Muzak plays, the Kenmore appliances and Craftsman circular saws are marked-down to practically free, but no one is buying and the amblers are all carrying bags that proclaim Bed, Bath and Beyond. Abandoned Sears outlet, Memphis, Tenn. Honest Ed’s rambling footprint, and the adjacent semi-charming tumbledown properties owned by the family of the late Edwin Mirvish, are reported to be worth around $100 million to condo developers. The store is a local legend, but with a nine-figure bankroll you can always hire a squadron of bloggers to write you a new legend. Creating a new legend appears to be precisely what David Mirvish, son of Ed, has in mind. In a city crammed with big, gruesome apartment blocks, he is proposing to develop three of the most visually repellent 80-story condo towers the town has ever cringed from, on the small plot of once-disused land old Ed had the foresight to purchase, near the Royal Alexandra Theater. 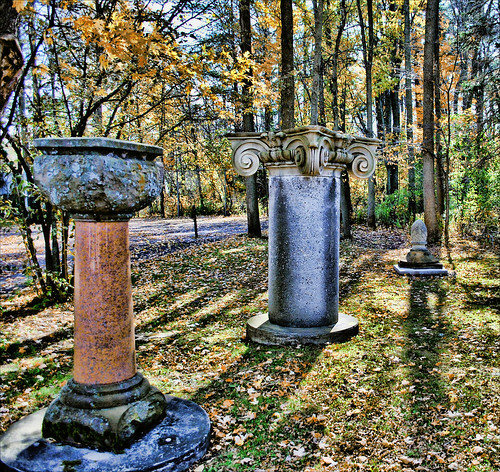 Preserved ghosts of old Toronto architecture, at The Guild Inn, Scarborough, Ont. Toronto once had an architectural heritage of a sort, but, as was the case in many cities, the notion of preserving pretty buildings fell out of favor in the early 1960s. That was when many of the burgh’s legacy structures were flattened in order to make way for the high-rise office towers named for banks. Cornices, facades, bits and pieces, looming frontages and propped-up veneers of the destroyed buildings were rescued by Spencer Clark, who operated an artists colony on the outskirts of town. Clark created from these ghosts of the past city a unique sculpture garden alongside his lodge and hotel. Until recently, The Guild of All Arts on the Scarborough Bluffs was one of the few soulful places in Toronto. Today, it’s an all-but-abandoned curiosity, one more monument on a Weird Scarborough sightseeing tour. It has been a topic most of us have been avoiding for perhaps the last 20 years, that Honest Ed’s had run out of time. The store was a post-World War II phenomenon, when the eponymous Ed opened a sweater shop on a never-fashionable block of Bloor Street West. He became an early master of the fine art of sourcing merchandiser’s close-outs, which are warehouses filled with distressed crap that no one wants. Nineteen-forty-eight, when Mirvish opened his doors, was a time of scarcity and readjustment, and the act of offering cheap goods was a welcome novelty. Customers rushed at an appointed hour to load up on discounted, if prosaic, products: rushed to load up on “door crashing specials.” Velveeta for a quarter. Bulldog Steel Wool for a dime. Rinso White for a nickle. Ed became a neighborhood hero. Then, after he bought some real estate housing boutiques and restaurants and renamed the block Mirvish Village, he became the neighborhood. If one measure of greatness is whether The Guardian honors you with an affectionate obituary, Honest Ed, the individual, was exceptional; his namesake emporium was not. Between 1946 and 1985, every podunk had at least one self-styled promoter frantically vending schlock out of run-down premises. There were the army surplus dumps, which were invariably named after some variation of G.I. Joe, and the electronics-and-camera dumps. From Madman Muntz in Los Angeles to Crazy Eddie in New York, the second half of the 20th century was the golden age of schlock and schlockmeisters. In Toronto, Ed belonged to a medium-sized fraternity of merchant-geeks, scattered from the Danforth across Spadina and on to Long Branch and Mimico, scrappy discounters with peppy noms de commerce such as Bargain Harold, Marty Millionaire, Mirthful Marvin, Hopeless Hubert, and so on. Each of these sales dynamos fled the scene long ago, followed into obscurity by their toned-down successors, such as Sayvette, Towers, and the venerable Zeller’s. At that, they were part of an older, and extensive, North American tradition described movingly by writer Stella Suberman in her 1998 book, The Jew Store, published by Algonquin Books of Chapel Hill, N.C. Honest Ed was the last of the old ’40s gang to endure into the new millennium, clinging to viability through some force that few could comprehend. Inside and out, the Bloor Street premises is still held together with hand-lettered aphorisms: “It’s fun to shop at Honest Ed’s.” These are all variations of the post-war yegg-speak intended by Mid-Century Man to crack up the boys in the diner. That frail’s got a swell set of gams. Pass me the giggle-water. Ah, you’re full of bunkum. If you’re so smart, why ain’t you rich? The cheque arrived promptly at my childhood home at 28 Stayner Avenue: my first payday for copywriting. The nearly full-page ad in the Toronto Telegram congratulated M. Shannon as the creative force behind the Ed-line. Ed made me. And also ruined me, by conditioning the impression that uttering a sharp remark might inspire strangers to hand over a wad of cash. I made a point of never discussing this accomplishment with anyone, since the notion of Ed-lines and their employed yegg vernacular, took on a dated, unseemly tone before I even reached puberty. I didn’t think that was copywriting worthy of a $25 prize — and, in the chain pub, that insignificant sum would barely pay for a cheeseburger and Kronenberg. But, look, it ain’t about the cleverness; it’s about the data-capture. And it isn’t about the playful cheekiness; it’s about getting you in the mood to hand over your e-mail address, so the IT department can begin to accumulate, study, and alter your spending patterns. Shoppers Drug Mart figured it all out. Eventually Loblaw’s did, too. Ikea, and Nordstrom, and Target all know it. And for that matter, so do Big Lots, Dollar Tree, and Dollarama. It’s the testament of the falling and fallen shopkeepers of the last century, speaking to our current generation. Aptly, it’s phrased in Small Data form: one last aphorism, before they hit the trail. Goods will break, bodies will rot, and bricks-and-mortar will one day crumble. But customer databases, Jack: them things will last forever.